Taking its name from the square situated next to Gran Vía del Marqués de Turia, the Cánovas area stretches from the Turia riverbed to Avenida del Reino de Valencia in the Eixample district of Valencia. The popular nightlife area is within walking distance from the centre via Calle Jorge Juan, passing by the impressive Colón market. Much like the zone of Barcelona of the same name, the Eixample area (Ensanche in Spanish) consists of streets and streets of nearly identical 100m blocks of buildings, the lower stories of which are filled with hundreds of bars and eateries. Many restaurants up and down Calle Conde de Altea, the main stretch of the area, provide inexpensive menus for both lunch and dinner*. And not just tapas. A tried and tested place is Rincón Alemán where you can sample, among other mouthwatering delicacies, a hearty goulash – all served by a jolly, mustachioed German gentleman. Although a meal here will set you back a few more €€€ than a typical tapas menu, it’s worth it thanks to the tasty food, pints of German beer and interesting décor. There is also a couple of sushi places kicking around here and there – Sushi and Tapas on Calle Salamanca and Miss Sushi in the plaza. Despite often being described as more of an “upmarket” area to go out, you can still find cheap and cheerful bars in the area. One of our favourites is Beer located on Calle Salamanca, a stone’s throw away from the plaza. More of a typical pub than a bar, the aptly-named cervecería offers cheap draft beer, cheaper-than-usual Desperados and good mussel tapas if and when the barman can be arsed. One block down from Beer lays a grubby yet cheap chupitería which often gets frequented at around 1am by already-pissed punters who have been drinking in nearby bars. Think sticky floors, damp counters and shots so strong that they make you wince. The place is actually called Pub Chupitos. Were they lacking in inspiration when naming bars in this area or what? Another interesting bar to check out is American-owned Portland Ale House. Do you miss the competitive thrill of quiz night down the pub with yer mates? Do you have a pub quiz shaped hole in your life since moving to Spain? 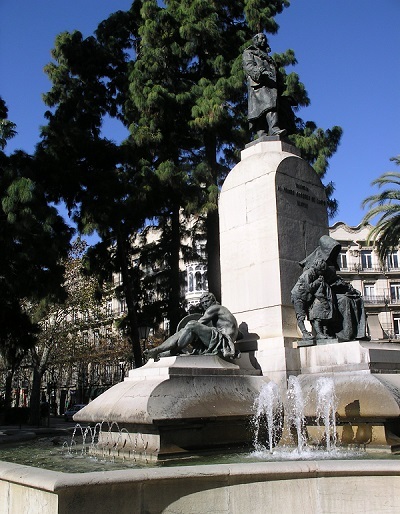 Head to Portland on Calle Salamanca on Sunday evenings to compete in the bilingual quiz. They also host language exchanges and stock some “exotic beers”. Speaking of, get your Strongbow and Guinness fix in St. Patrick’s Irish Pub on Gran Vía. Mine’s a pint thereof. And what about dancing? Number One in Plaza Cánovas seems to be one of the go-to places to shake your thang to reggaeton and pop in the Cánovas area. If that doesn’t float your boat, try rock club StandBy on Avenida de Jacinto Benavente. In true rock nightclub style, the loos are a state and the clientele is often drunk and dressed in black band t-shirts, but I’m sure you won’t let that ruin your night. Owing to its pretty central location, moving to different neighbourhoods or heading to the nightclubs on Blasco Ibáñez is really quite painless. The recently launched CORREnit nocturnal bus service can even take you to any of the other main going out areas of the city, something that the Spanish constituent of Sepia would have dearly loved in his life about 10 years ago. Well done, EMT, you’ve done something right! Find most of the places mentioned in this post over on our Valencia highlights map. Get to Cánovas via the red (L1) or green (L5) metro line to Colón and walk down Calle Jorge Juan. Alternatively catch the number 2 or 3 bus or the N1 nitbus straight to Plaza Cánovas. *For all you Yorkshire folk reading, that’s DINNER and TEA.